MANHATTAN, N.Y. — A four-year-old girl walking in Riverside Park with her mother suffered a serious head injury on Monday, April 8, 2019, after a bicycle rider hit the girl and knocked her down according to the West Side Rag. The mother brought her daughter to a local hospital for treatment of a large cut on the child’s forehead. The young girl is expected to recover completely. Many incidents like these have injured several children, including two others that same day. To combat this problem, local authorities will create a new bike path through Riverside Park in some, but not all, areas. 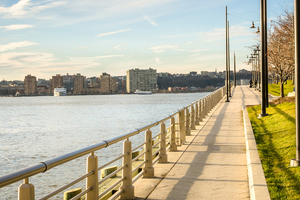 New York City authorities declared an intention to build a second path to alleviate some of the congestion on the existing trail. The plan will not eliminate all of the congestion, however. The current plan calls for construction of the second path between 72ndStreet and 83rdStreet. The city will designate one way for cyclists and the other for pedestrians. The mother of the child injured Monday told reporters that she and her children had left one of the soccer fields and was walking along the water near a café. The group stopped to take a photo, and a group of cyclists sped through. The mother said she was aware of the number of bike riders in the park. Despite the mother’s awareness, she heard a cyclist yell a warning to her daughter, but it was too late. The cyclist stopped to check on the girl. The mother took her child to the emergency room. A photograph of the child taken by the mother and published by the West Side Rag with her permission shows a nurse holding the girl’s head still while bright red blood streaks down her lacerated forehead. The mother told reporters she met two other parents in the emergency department whose children were injured that day by bicycle riders. One child was hurt while in Riverside Park, and the other was in Central Park.